Is it just me or are polish brands really starting to bend the "rules" of seasonality? Spring stuff usually doesn't catch my eye, but I let out an "oooh!" when I saw the Flight Patterns display at Wegmans recently. It's got four new shades and three of them are...yes...shimmer toppers! The fourth is a blue cream. If they'd tried specifically to make stuff I'd be sure to buy, they could barely have done any better. There was no way I could pass these up. Sheer Flight has fine golden-green shimmer in a sheer teal base. All three of these toppers look a little shifty in the bottles, but it really doesn't translate strongly on the nail. That's hardly a letdown though, because this shimmer is glorious! If there's a shift to Sheer Flight, it might be slightly golden at the edges. The tint darkens and "greens" the base, but only moderately. 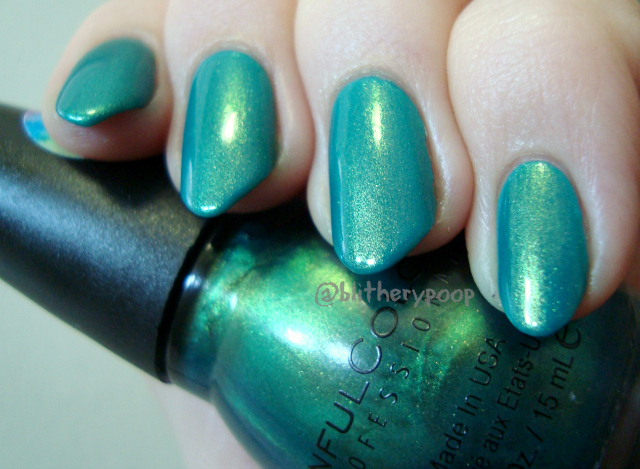 This is one coat over China Glaze My Way Or The Highway, which is a lightish teal. 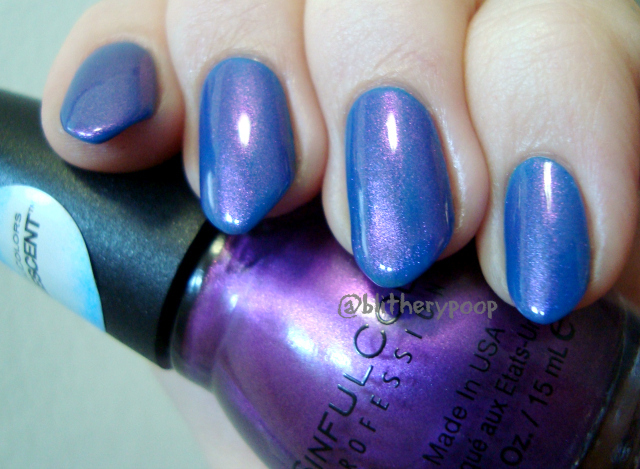 Flight To See has fuchsia shimmer in a sheer purple base. The change to the base color is much stronger here. Much. Flight To See darkens and cools whatever's under it considerably. The shimmer pops beautifully over the darkened base though! This is one coat over China Glaze Licence & Registration PLS, which is sky blue. 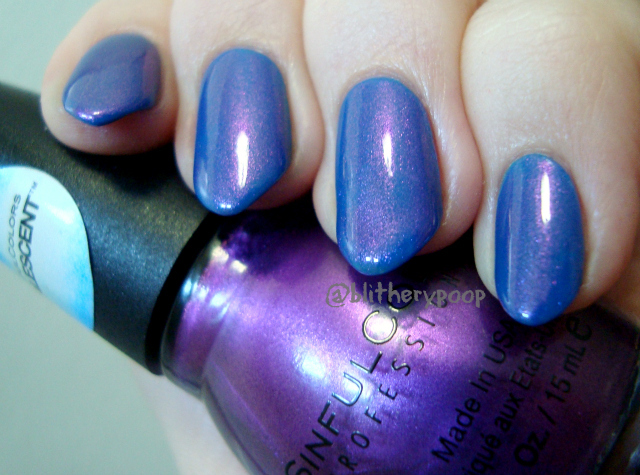 Prized Plume has intense, ultra-fine blue shimmer in a sheer blue base. AAAHH!! Favorite! I can see this being one of my Best Of 2015 picks at the end of the year. The shimmer is so dense and fine that it looks almost metallic. I die. Over a dark base like Navy I Do, there's a darker at the edges effect that absolutely blows me away. This is one coat over the last new shade in this display. 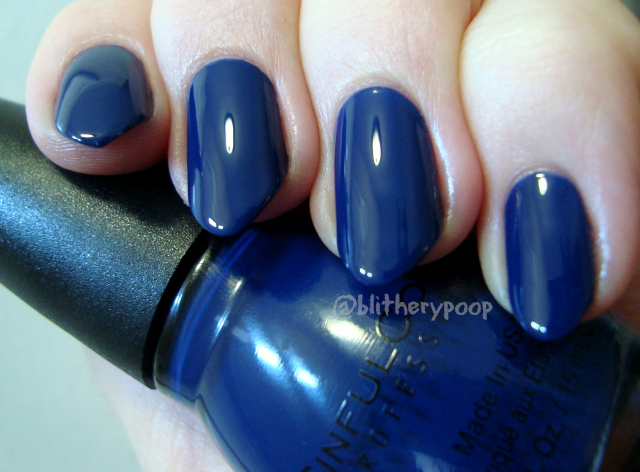 Navy I Do is a dark blue cream. Pretty, isn't it? It's also...drumroll please...a one-coater! You know I love it. I don't think I'd really call it navy, since it doesn't have that grayish thing that navy should, but it's a beauty anyway. There are four repromoted shades this time around. I apparently don't have a swatch of Nail Junkie. Weird. Here are the other three. Click the shade names for my original reviews. Bottom line: So much yes! The only shade I can't give a thumbs up to is Gold Medal...though G. from Nouveau Cheap called it her favorite metallic, so maybe I'll give it another chance. Maybe. It was a streaky mess when I swatched it. Boo. The rest though? Pure win. All four new shades are terrific! It's also a good time to go looking for them. If you haven't heard, the Walgreens 99¢ sale is back on through 2/28! I haven't seen any of the new shades at a Walgreens around here, but I know others are starting to spot them. These are all lovely, I especially like Flight To See. Did you wear the navy for long enough to see if it stains? I really like the color, but I'm pretty wary of Sinful blues. I got all three of the toppers, and I am in love! If you do stamping, Gold Medal works wonders! I bought all of these in the 99cent sale the other day, and can't wait to try! 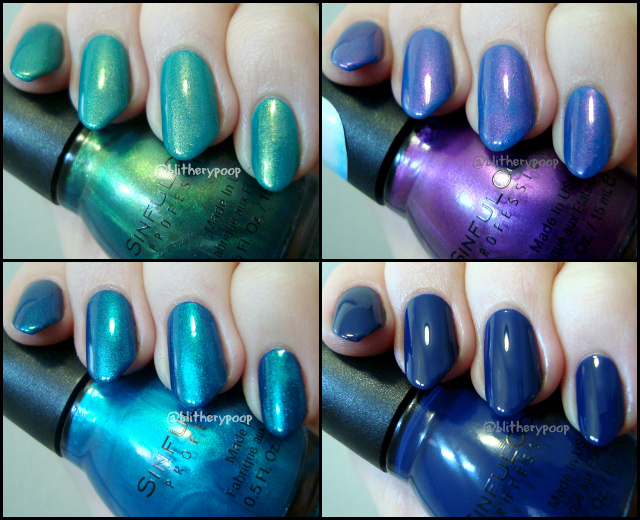 I love when Sinful comes out with new polishes. Too many repromotes lately, it seems. Thanks as always Amanda!